Your home’s roof is designed to prevent water intrusion from rain or snow. This design incorporates many more elements than just your shingles or gutters. One of the most important, but often overlooked, components to a dry, structurally sound roof is appropriate soffit structure. Whether you need new soffit installation or a small repair in the Minneapolis, MN, area, trust Beissel Window & Siding. Soffits contribute to your home’s ventilation. Soffits appear at the bottom of your eaves. Wherever your roof extends past your exterior walls, the bottom of the roof is finished with soffits. Soffits are usually made of vinyl and match the color of your other trim. Soffits feature a series of small holes designed to help air circulate through your attic, eliminating moisture buildup and improving energy efficiency. When this component becomes damaged, your home is at higher risk for unpleasant smells, water damage, pest infestation, and mold development. Most soffit damage occurs due to poorly maintained gutter systems or extreme wet weather. These conditions expose the soffits to moisture for long periods, which can break, warp, or obstruct the soffits. If you notice a change in attic ventilation or soffit appearance, consult with a member of our team. We can have our expert team perform soffit repair or remove and replace the existing soffits after serious damage occurs. The Twin Cities area has come to trust Beissel Window & Siding over the course of nearly 70 years. We understand that our products and services are intended to safeguard and improve your home. Our professional craftsmanship ensures that each installation and repair we complete protects the client’s property for years to come. 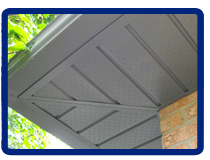 Make us your soffit contractor today by calling 651-451-6835 or filling out our online contact form. Our West St. Paul, MN, office serves the entire Twin Cities area.